It is always rewarding for us to see our clients recognized for their work. But when they’re honored on an international level, it’s all the more satisfying. 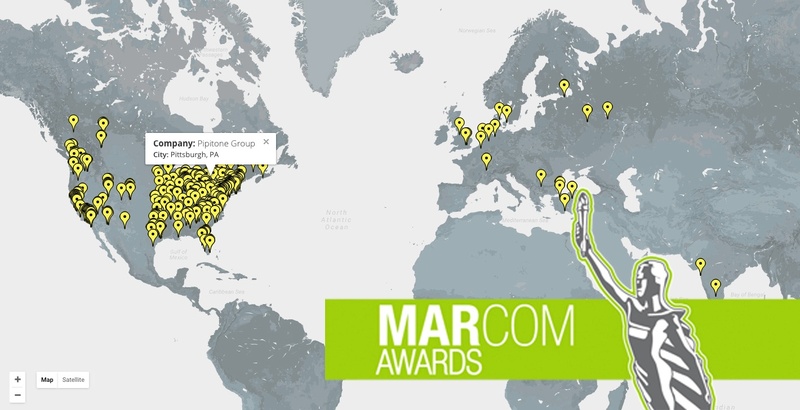 That type of global recognition was on display this November, as five of our clients were bestowed with MarCom Awards, one of the largest and most respected creative competitions in the world where over 6,500 entries were submitted from 19 countries this year. Pipitone Group (PG) and its clients earned a pair of Platinum Awards as well as a Gold Award in addition to two Honorable Mentions, while PG’s internal marketing initiatives won gold in two categories of their own to bring our total MarCom Award count to seven. With these awards, PG has now earned a total of 22 awards in 2017! We assisted Kraft Heinz in launching its newest pickle flavors in more than 50 years. 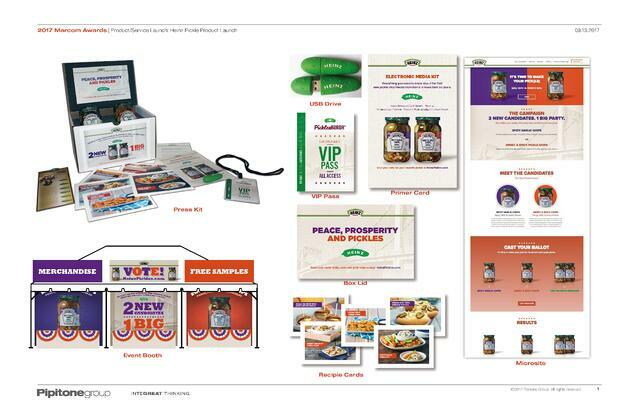 PG played off 2016’s contentious election season by launching a campaign for each flavor and utilizing a two-pronged media relations approach, catering to both local and national markets. We generated a custom media kit that included samples of Heinz’s newest products (spicy garlic dill chips and sweet & spicy dill chips), a pickle-shaped USB drive with information, recipe cards and a VIP pass to Pittsburgh’s second annual Picklesburgh event. 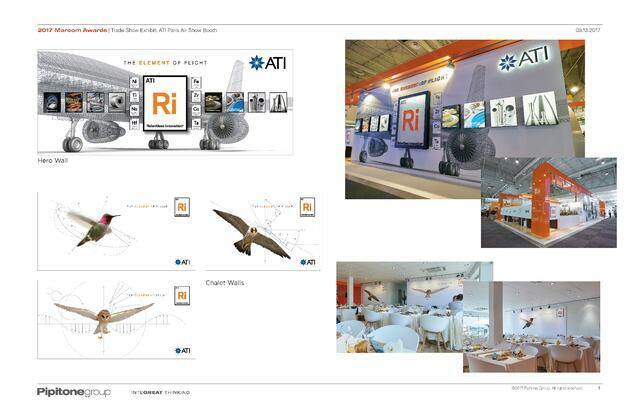 The Paris Air Show is the premier event in aerospace, and as a global manufacturer of technically advanced materials that help to drive the industry, ATI wanted to create a memorable in-booth and chalet experience for customers attending the world’s biggest air show. At ATI, Relentless Innovation is elemental. PG played off the periodic table of the elements for the trade show booth to position ATI’s mantra of Relentless Innovation as a pivotal element in the raw materials, metallurgy, chemistry and engineering that make aviation possible. In the chalet area where customers had a front row seat to the air show, PG rendered “The Formula For Flight,” a concept depicting the science behind birds in motion—the origins of flight at its earliest stages. “In the aeronautics industry, it doesn’t get any bigger than the Paris Air Show, and working with ATI on this project was rewarding for us,” said Jeff Piatt, Chief Creative Officer. “The team at ATI worked seamlessly with us to collaborate on a pair of trade show concepts that helped to drive traffic to its booth and chalet. 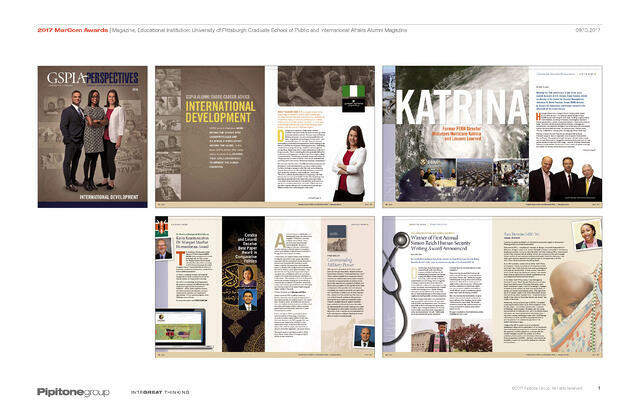 Written by a combination of faculty, staff and students, the University of Pittsburgh Graduate School of Public and International Affairs (GSPIA) tasked PG with editing and designing its annual alumni magazine. Each issue focuses on a certain program area, with this edition centering around GSPIA’s Master of International Development, one of the school’s three two-year master’s degrees. Other magazine features include a letter from John T.S. Keeler — the school’s dean — as well as alumni/student stories, alumni awards, school news, a featured lecture series and more. 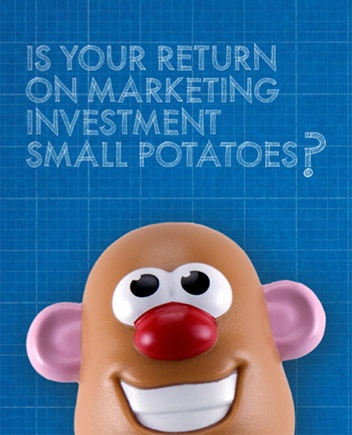 With a variety of marketing agency options available to architectural building product manufacturers, PG needed to flex its creative muscles to develop a wholesome and memorable campaign with eye-catching imagery and messaging to convert prospects into customers. By launching a relationship-building campaign, PG could introduce itself to a vetted prospect list of nationwide architectural building product manufacturers, leveraging a free competitive audit to help prospects better understand a primary competitor of their choosing. PG conceived the X-ray metaphor to reinforce the idea of “seeing through your competition” and taking a “bite” out of market share. 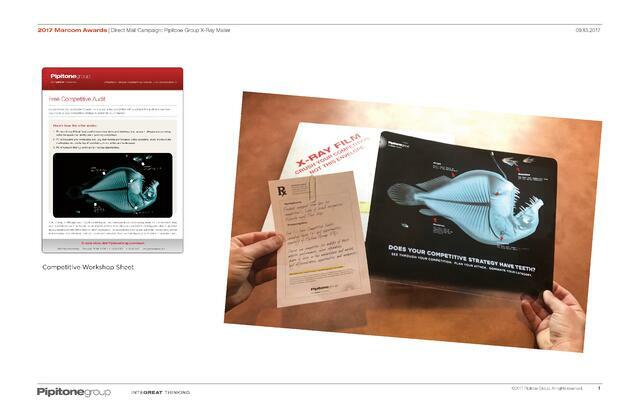 These messages, accompanied by an angler fish illustration, reinforced key pain points about how manufacturers perceive their competitors. As the final destination, a landing page was designed with key messaging, directing architectural building product decision-makers to fill out a short form to receive their free competitive audit. The transition into foster care can be a difficult one for today’s youth, and many are even placed into homes with few or no personal possessions. PG took this issue to heart, teaming up with the Foster Love Project to provide a group of local children with a bag of items to call their own, while also working to raise awareness of the plight of far too many young people. PG employees filled 50 bags full of essential items for local teenagers, while developing a landing page and social media outreach to complement its awareness campaign. 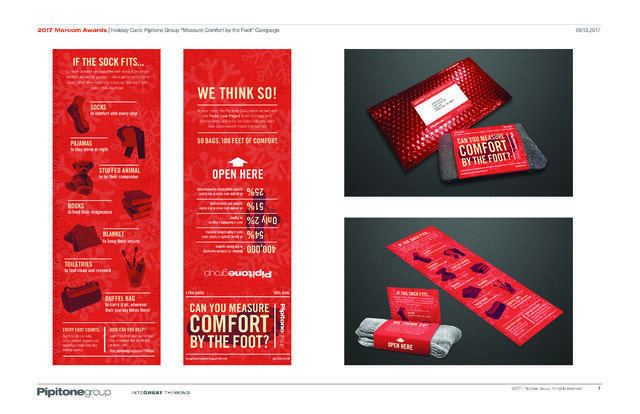 With the campaign headlined, “Can You Measure Comfort By The Foot?” PG packaged a pair of wool socks with an informational brochure alerting people to the cause, providing additional information on our work with the Foster Love Project and driving them to the page. The packaged socks were sent to clients, friends and family in an effort to further the worthwhile cause that generated 2,300 foster love duffel bags, as well as gift cards and monetary donations. Presbyterian SeniorCare Network hosted the Silver Factory Experience event to celebrate Woodside Place’s (its facility that cares for people living with Alzheimer’s and related dementias) silver anniversary. 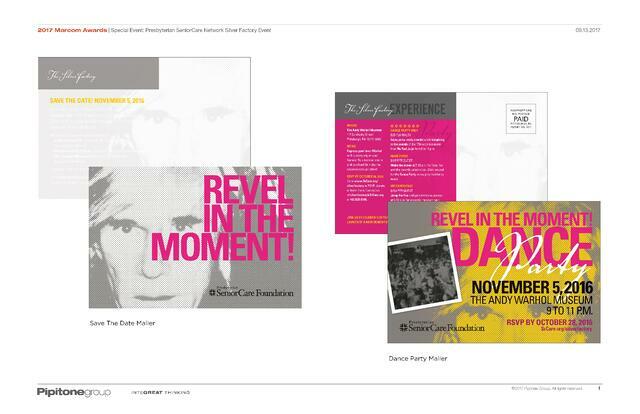 Held at the Andy Warhol museum, PG not only implemented direct mail and targeted digital/print ads and invitations to generate excitement for the event, but framed the entire event around a Warhol-esque motif. The theme captured the spirit of those who live with dementia and their unique ability to truly revel in the moment. Surrounded by bold colors inspired by Pittsburgh artist Andy Warhol’s work — a look that incorporated PG’s branded advertising campaign for Presbyterian SeniorCare Network — the energizing atmosphere could be felt throughout the event for over 260 attendees, from the signature cocktails to the custom signage. With its Sub325® system, Somerset Coal cracked the code to fine coal recovery, allowing plant operators to capture 95 percent or more of ultra-fine clean coal, a number plant operators had previously thought to be unattainable. 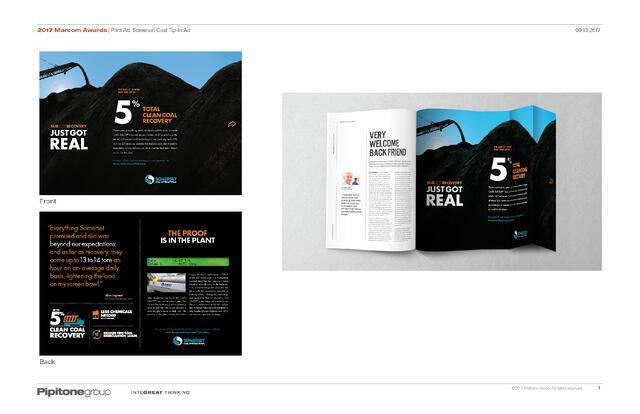 As plant operators across the country began realizing both material and economic gains due to Somerset Coal’s technology in their facilities, PG was tasked with creating an ad campaign that portrayed that Somerset Coal customers were achieving real results — and the proof was in the plants.